XLIII.22-38; Tatian's Diatessaron (c. 150-160). Historia Calamitatum: The Story of My Misfortunes, Pierre Abélard / Peter Abelard, c. 1140. "Usury or loaning money at interest is strictly forbidden by the Bible, Ex 22:25-27 De 23:19,20. ... Finally the master said to him sarcastically why did you not add insult to injury and loan the money out at interest so you could call your master a "usurer" too! If the servant had done this, his master would have been responsible for his servant's actions and guilty of usury." "Christ keeps no servants to be idle: they have received their all from him, and have nothing they can call their own but sin. Our receiving from Christ is in order to our working for him." "So mere harmlessness, on which many build their hope of salvation, was the cause of his damnation!" "He takes the servant's own account of his demands, as expressing graphically enough, not the hardness which he had basely imputed to him, but simply his demand of a profitable return for the gift entrusted." "Every attainment of honor, wealth, knowledge, or spiritual grace helps to render further attainment more easy and more assured; while it is spiritually as well as materially true that "the destruction of the poor is their poverty" (Prov. 10:15)." Commentary, Matthew 25:14-30, David Schnasa Jacobsen, Preaching This Week, WorkingPreacher.org, 2017. "Look to the Acorns," Ragan Sutterfield, Radical Discipleship, 2017. "What Do You Have To Lose?" Janet H Hunt, Dancing with the Word, 2017. "Entrustment," Karoline Lewis, Dear Working Preacher, 2017. "Dreadful or Wonderful Piety," Glenn Monson, Law & Gospel Everywhere, 2017. "The Coming of the King," Commented Bible Passages from Taize, 2015. Commentary, Matthew 25:14-30, Greg Carey, Preaching This Week, WorkingPreacher.org, 2014. "Does the parable of the talents admonish disciples that they'd better get useful or they might face judgment? Or does the parable subvert traditional images of an authoritarian and threatening Jesus?" "How Do You Imagine God?" David Lose, ...in the Meantime, 2014. "Jesus has spent his life and ministry proclaiming God's kingdom, feeding the hungry, healing and sick, offering forgiveness, and welcoming ALL who recognize their need into the loving embrace of God. And for that message he is crucified. That's how much God wants us to know of God's love. And just in case we miss or underestimate that message, God raises Jesus on the third day that we might know that life is stronger than death and love more powerful than hate." "The Politics of the Talents," Mark Davis, Political Theology, 2014. "It is a descriptive parable of someone who refused to participate in that process, in a situation where absentee landowners and their lackeys were the primary interface between Jewish peasantry and the Roman Empire. That servant—deemed "lazy" and unfaithful by the Empire—pays an awful price for refusing to play along." "Return on Investments," Bob Cornwall, Ponderings on a Faith Journey, 2014. "Living (as we do) in the interregnum (in between times), we should be faithful with the resources given to us. Rather than burying them, we should be investing them. That is, we should look at life through the lens of abundance rather than scarcity." "the Parable of the Faithful Servant," Stan Duncan, Jubilee Justice Blog, 2014. "Merit Badges," Alan Brehm, The Waking Dreamer. "If the parable of the talents is not ironical, then the 'Kingdom of Heaven' is about a strict system of earning rewards, and there's not much room for grace or forgiveness or mercy." "Gift as Burden/Gift as Freedom," Clint Schnekloth, Question the Text, 2014. "So what does it look like to preach the gift until it actually frees?" "Does our performance match our profession?" Steve Godfrey, Church in the World, 2014. "How about you? When you look at your own performance, where are you doing well? Where do you need to do better?" "Burying the Talent," Suzanne Guthrie, At the Edge of the Enclosure, 2014. "Good and Faithful Servants," Thomas Beam, 2014. "The Fearful Slave," Janet H. Hunt, Dancing with the Word, 2014. "What do you think the 'talents' represent in this story?" "The Risk Takers," Nancy Rockwell, The Bite in the Apple, 2014. "Love and faith, like money, require the taking of risks in order to grow." Evangelio Comentario del San Mateo 25:14-30 por Justin Eller, Working Preacher, 2014. Commentary, Matthew 25:14-30, Carla Works, Preaching This Week, WorkingPreacher.org, 2011. "The parable of the talents is among the most abused texts in the New Testament." Holy Textures, Understanding the Bible in its own time and in ours, Matthew 25:14-30, David Ewart, 2011. "This a Wisdom parable teaching us about the perils and difficulties of the ways of the world until the Kingdom comes." Parable of the Talents, audio telling, story in episodes, graphic, audio and written commentaries. Go Tell Communications, Biblical Storytelling for the Global Village, 2011. Two Sides to Every Story, Linda Fabian Pepe, Theological Stew, 2011. "So when the wealthy man comes back, the first two servants get rewarded for doing what they were charged to do… make money. The third servant, because he hid his talent, gets punished- he is cast out. But it is this third servant, in this version of the story, who might be called the hero. Because it is the third servant who saw." "Reading the Text Abundantly or Protectively," Russell Rathbun, The Hardest Question, 2011. "Are You Ready to Risk?" Peter Woods, I Am Listening, 2011. "To find the access point for this teaching in today’s gospel, one has to backup to Matthew 24:3." "Good and Faithful," Fr. Rick Morley, a garden path, 2011. "No Time for Timidity," Alyce M. McKenzie, Patheos, 2011. Behind the Scenes at Bernie Madoff's: A parable, Scarlet Letter Bible, 2011. Comentario del Evangelio por Amaury Tañón-Santos, San Mateo 25:14-30, Working Preacher, 2011. Commentary, Matthew 25:14-30, Dirk G. Lange, Preaching This Week, WorkingPreacher.org, 2008. "Talents: Five, Two and One," Gospel Analysis, Sermons from Seattle, Pastor Edward F. Markquart, Grace Lutheran Church, Seattle, Washington. Detailed background and exegesis. "To whom much is given much will be required. We know that this principle is true even if a person is not religious. That is, a common adage for the whole world is the intuitive awareness that the more gifts/resources/abilities that God has given to you, the more that life/God requires of you." "First Thoughts on Year A Gospel Passages in the Lectionary," William Loader, Pentecost 23, Murdoch University, Uniting Church in Australia. "The tragedy is that many people are afraid of losing or endangering God and so seek to protect God from adventures, to resist attempts at radical inclusion that might, they fear, compromise God's purity and holiness. Protecting God is a variant of not trusting God." "When the master "gives" ("paradidomi") his property to the slaves, does the money then belong to the slaves -- thus presenting God as being very generous? Or are the slaves just managers of their master's money -- thus presenting the slaves as stewards of what belongs to God?" Dylan's Lectionary Blog, Proper 28. Biblical Scholar Sarah Dylan Breuer looks at readings for the coming Sunday in the lectionary of the Episcopal Church. "The live question for us, I think, about this Sunday's gospel is whether we can really believe that, if we really can trust in that enough to risk living as Jesus taught us rather than according to the demands of those who try to set themselves up in Jesus' place as our lord, who try to enslave us to wordly standards by telling us that our security is in acquiring resources for ourselves and striking out at our enemies." "The Parable of the Extortionist," Larry Broding's Word-Sunday.Com: A Catholic Resource for This Sunday's Gospel. Adult Study, Children's Story, Family Activity, Support Materials. "Have you ever felt like an outcast? What attitude or chain of events caused your feelings?" "The Parable of the Talents," Rev. Bryan Findlayson, Lectionary Bible Studies and Sermons, Pumpkin Cottage Ministry Resources. Includes detailed textual notes. Wellspring of the Gospel, Ordinary 33A, Catherine McElhinney and Kathryn Turner, Weekly Wellsprings. "The Parables in the Olivet Discourse," by Hampton Keathley IV at the Biblical Studies Foundation. "The works are indicative of the relationship with the master. The third slave had no works which in the gospels is the same as having no faith." "Parable of the Talents," wikipedia. Brisson, E. Carson, "Between Text & Sermon, Matthew 25:14-30," Interpretation, 2002. Carpenter, John B., "The Parable of the Talents in Missionary Perspective: A Call for Economic Spirituality," Missiology, 1997. Chenoweth, Ben, "Identifying the Talents: Contextual Clues for the Interpretation of the Parable of the Talents," Tyndale Bulletin, 2005. Chilton, Bruce D., "Talents and the Art of the Parable," The Living Pulpit, 1997. Dipboye, Carolyn, "Matthew 25:14-30--To Survive or to Serve," Review & Expositor, 1995. Hiebert, Paul G and Sam Larsen, "Partnership in the Gospel: Misers, Accountants and Stewards," Direction, 1999. Howell, James C., "Trojan Horse," the Christian Century, 2005. Lovette, Roger, "On Not Missing the Circus," The Living Pulpit, 1997. McGaughy, Lane C., "Fear of Yahweh and the Mission of Judaism: A Postexilic Maxim and Its Early Christian Expansion in the Parable of the Talents," Journal of Biblical Literature, 1974. Steinmetz, David C., "Matthew 25:14-30," Interpretation, 1980. Thysell, Carol, "Unearthing the Treasure, Unknitting the Napkin: The Parable of the Talents as a Justification for Early Modern Women's Preaching and Prophesying," Journal of Feminist Studies in Religion, 1999. Toussaint, Stanley D., "A Critique of the Preterist View of the Olivet Discourse," Bibliotheca Sacra, 2004. Ukpong, Justin S., "The parable of the talents (Matt 25:14-30): commandation or critique of exploitation? : a social-historical and theological reading," Neotestamentica, 2014. "How Are You Managing?" 26 Pentecost - 13 November 2005, Samuel Zumwalt, Göttinger Predigten im Internet: Every Sunday Sermons based on the RCL by a team of Lutheran theologians/ pastors. "Talents: Five, Two and One," Sermons from Seattle, Pastor Edward F. Markquart, Grace Lutheran Church, Seattle, Washington. "The Story of Two Parables," Phyllis Tickle, Day 1, 2002. "Reluctant Servants," the Rev. Bob Bohl, Day 1, 1997. "The Three Toolboxes," Charles Kirkpatrick, Sermons4kids.com. "A Fearful Man Hides His Treasure," Sunday School Lessons: Family Bible Study, art projects, music, stories, etc. "The Wizard of Odd," Christin Kuck, dramatix. "Parable of the Talents," Mike Treachler, dramatix. "Talents Anonymous!" Michele Pitman, dramatix. "The Master Went on a Journey," from A Certain Jesus by Jose Ignacio and Maria Lopez Vigil. Ideal for catechetical and liturgical dramatization of today's gospel. Claretian Publications. Clip Art Images: Matthew 25:14-30, Misioneros Del Sagrado Corazón en el Perú. 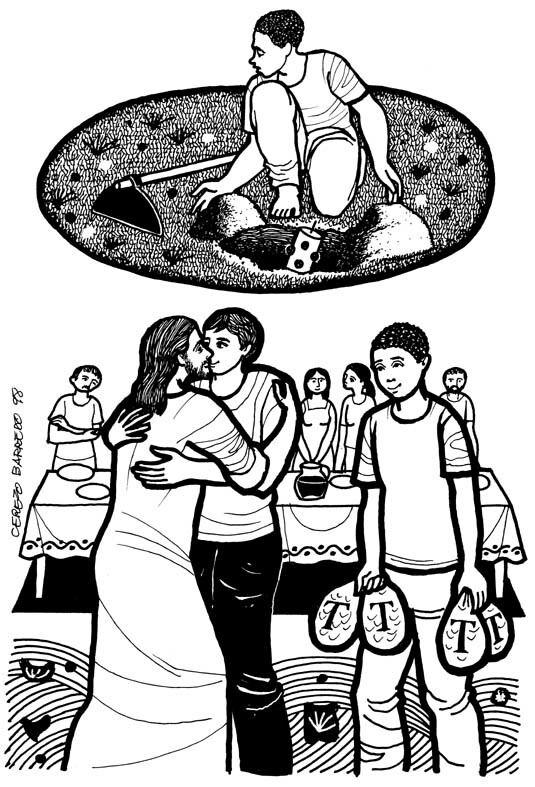 Matthew 25:14-30, at Cerezo Barredo's weekly gospel illustration. Liberation emphasis. Bulletin Cover for Matthew 25:14-30, PowerPoint Slides for Matthew 25:14-30, Will Humes, Word & Table. “O God, We Yearn for Safety”an original hymn by Carolyn Winfrey Gillette based on Jesus’ Parable of the Talents (Matthew 25:14-30). Tune: ANGEL’S STORY 7.6.7.6 D ("O Jesus, I Have Promised") and AURELIA (“The Church’s One Foundation”). Hymns with Scripture Allusions: Matthew 25:21, 23, 29. The Cyber Hymnal.